Kills all stages of fleas (adults, eggs, larvae, pupae) and ticks on carpet. Botanically-derived insecticide also contains cleansing agents, lanolin and special conditioners. Rich-lathering shampoo kills flea eggs in addition to fleas, ticks and lice. Unique breakaway collar provides 8-month flea and tick protection for cats and kittens. Waterproof collar provides flea and tick protection for dogs and puppies 12 weeks and older. 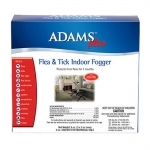 Reaches pests hidden in carpets, rugs, drapes, upholstery, pet bedding and floor cracks. Kills & repels adult fleas, flea eggs, flea larvae & ticks, & repels mosquitoes on dogs, cats, puppies & kittens. Contains Precor Insect Growth Regulator to kill flea eggs and larvae for 7 months. Kills and repels fleas, ticks, lice, gnats, mosquitoes and flies on dogs and cats, add to water. Provides long-lasting flea, tick and mosquito protection for up to 1 month. 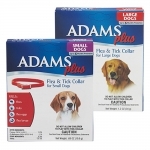 Kills adult fleas, flea eggs, flea larvae, adult ticks, tick nymphs and tick larvae. 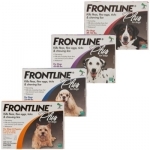 Kills fleas, flea eggs, flea larvae and ticks on dogs and puppies over 10 weeks of age, 16 oz. Starts killing fleas & ticks on contact in just 15 minutes, repels mosquitoes for up to 4 weeks. 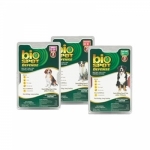 Kills fleas, ticks, flea eggs and larvae, and provides continuous protection for up to 5 months. Absorbable, sterile surgical gut suture, processed to provide greater resistance to absorption. Fast acting formula to stop itching from flea bites, with citrus & d-Limonene, gentle on skin, moisturizes too. Fast acting, triple-action formula to stop itching from flea bites, with citrus & d-Limonene, moisturizes too. Soothes irritated skin, from flea bites, with maximum strength ingredients, but gentle on cats & dogs skin. 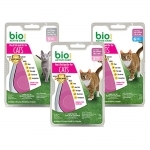 Fast-acting, long-lasting complete control of flea, tick and chewing lice, for all cats. This fast-acting and long-lasting squeeze-on breaks the flea life cycle. Adjustable velcro fasteners on the back for easy attachment, 2 eco-friendly inserts are included. Fast acting flea and tick control, released over time and approve for puppies 8 weeks and older. Helps restore comfort to pets - Contains cedar oil, a naturally occurring insecticide, to combat fleas, mites, mosquitoes and other pests. 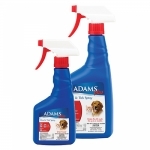 Kills fleas and ticks instantly and keep them off for days, easy-to-use trigger sprayer. 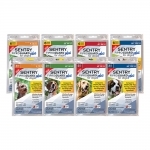 For use on horses, beef/dairy cattle, swine, dogs & cats, controls fleas, ticks & lice up to 10 days.